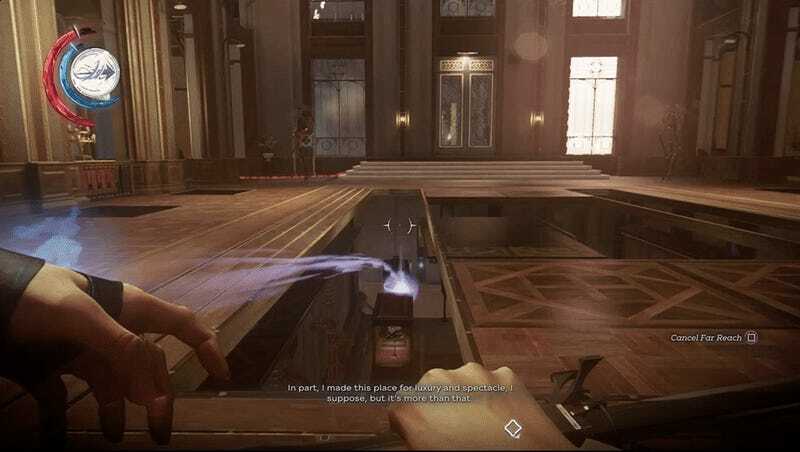 Dishonored 2 lives and dies by its level design. Tricky guard patrols and magical abilities don’t mean much without a good playground to sneak around in. Luckily, the game has one of the best levels in recent memory: the transforming Clockwork Mansion. Playing as either Corvo or Emily, the player is tasked with disposing of Kirin Jindosh, Grand Inventor to the treacherous Duke Abele. He’s kidnapped the brilliant inventor Anton Sokolov. The player needs to sneak in, deal with Jindosh, and get Sokolov out in one piece. For simplicity’s sake, we’ll follow one path through the mansion, calling attention to smart design decisions while pointing out divergent paths as we go. An important decision right from the start is to place the mansion directly in the player’s view. To get to the mansion, the player must travel between an upper and lower city ward via carriage. Traveling to the upper ward places the player on a track where they can’t miss the mansion. It frames the objective and gives a clear sense of the upcoming area’s scale. While players can opt to unlock the carriage gate to continue their journey, there’s also an alternate lower path beneath the rails. This path is good for players eager to make their way to the main objective. They can head right to the mansion. It also has the added benefit of placing the player on a lower level as they approach the mansion. This makes it look a bit more ominous when they approach. It gives the space a bit more weight. The mansion itself is one of the most immaculately maintained spaces in the game. A shift in the color palette from cold grey and blue to warm lights and red carpets sets the location apart from Addermire Institute or the dreary streets of Dunwall. Adding to this sense of cleanliness is the fact that the Clockwork Mansion has no bloodfly nests whatsoever. A prominently placed audiograph gives us our first taste of Kirin Jindosh. His voice has a crisp, clipped lilt that teeters on the edge of menace. He welcomes all guests but warns that any intruders will meet their end. The only way to progress is to move into an adjacent chamber that seems to lead to a dead end. The design calls attention to a switch that is conspicuously placed and brightly lit. We’ll pull the lever to proceed. This is where the Clockwork Mansion showcases its major hook. The rooms transform into a new configuration when levers are pulled. It also calls up a dormant clockwork soldier here so that the player can safely observe this level’s elite enemy. There’s two paths. We can move upstairs or through the lower hallway. Jindosh is calling us to meet him upstairs, so let’s do that. 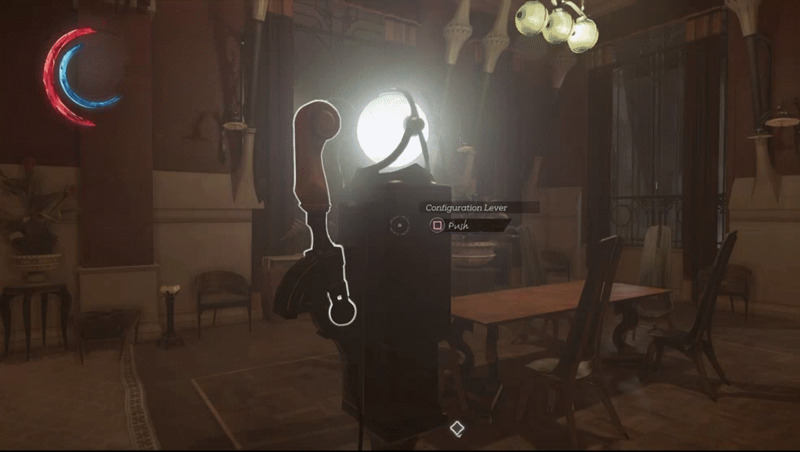 Much like the initial approach to the mansion, players get a chance to observe their objective once more when they come face to face with their target. This is a marked change from Addermire, where the target’s identity is deliberately ambiguous. Jindosh is so confident in his security that he constantly taunts you throughout the level over the intercom. His dialogue forms the basis of a cat and mouse game that gives the Clockwork Mansion more energy than any other level in the game. Jindosh will comment on your powers, express shock if you best his challenges, or even get frustrated if he loses track of you. The interplay between the player and Jindosh, combined with his posh character, recalls other high quality FPS levels. Particularly, the notion of being hounded by a self-proclaimed artist conjures memories of Bioshock’s Sander Cohen and Fort Frolic. The Clockwork Mansion surpasses that level by virtue of more complex and well-realized level design. 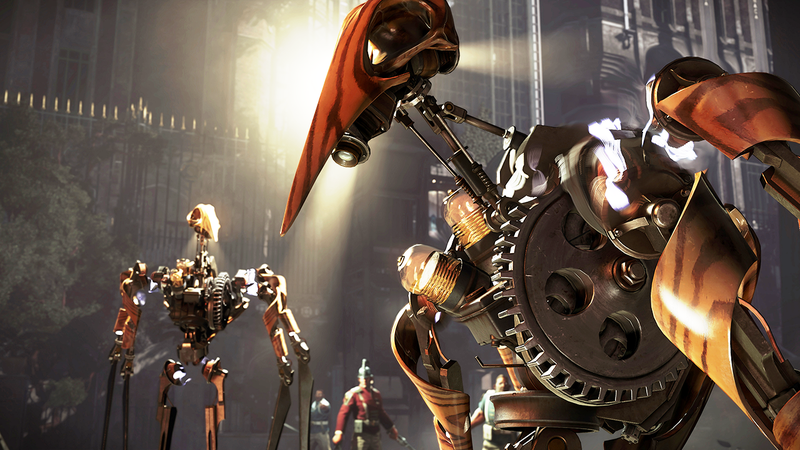 After the initial conversation, Jindosh calls in two active clockwork soldiers. To ensure the player has options for staging attacks or escaping their view, the space once again transforms to add display cases to block lines of sight as well as chandeliers to hide on. Clockwork soldiers can only see straight ahead or behind them. Offering multiple angles and some verticality helps this first encounter feel fair. Observant players might notice a power line snaking below the floor. This is a conveyance tool meant to hint at one of the mansion’s more devious secrets: players can go behind the walls to bypass obstacles. In this case, we are given access to a panel where we can disarm or rewire the wall of light above us. The early segments in this mission encouraged us to head to the black market to buy rewire tools. Compulsive players can use any extra here to access a direct path to Jindosh. This is the path we’ll take. An important thing about the various walls of light or tesla coils throughout the level is that while they initially bar travel routes, rewiring them offers the player a powerful tool against the clockwork soldiers. You can lure them with noise or bait them into chasing you into an instant death. This means that as you open up pathways throughout the level, you potentially arm yourself against its most dangerous enemies. Following down this path not only provides a fast path to Jindosh, it also offers a well-placed hint about the non lethal option for taking his down. Players eager to restore their mana will be all too glad to take this Addermire potion. A note next to it on the table mentions Jindosh’s electroshock machine. It’s a simple trick that helps players traveling on this route have an idea of their options for dealing with Jindosh. We reach another dead end. By now we know that switches can alter the landscape. Reaching this pathway can require some tricky navigation. The level design decides to double down on the central gimmick here in order to communicate that this is an unorthodox path to Jindosh. It also functions as a reminder that should this approach prove too difficult, players can hunt for alternate paths using the mansion’s transformations. Jindosh is calmly ambling about his laboratory, flanked by two clockwork soldiers. The space here functions as an arena. Large pillars provide easy ways to block line of sight. There’s also a few desks to hide under. 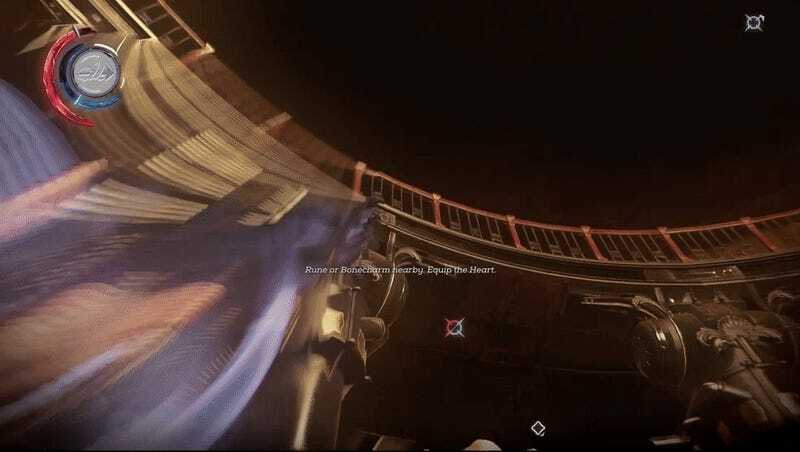 It is important to note that the game limits the number of clockwork soldiers in this encounter. We’ve dealt with two at the start, and while it might be tempting to up the challenge and add more, Jindosh functions as another set of eyes that can catch us sneaking. 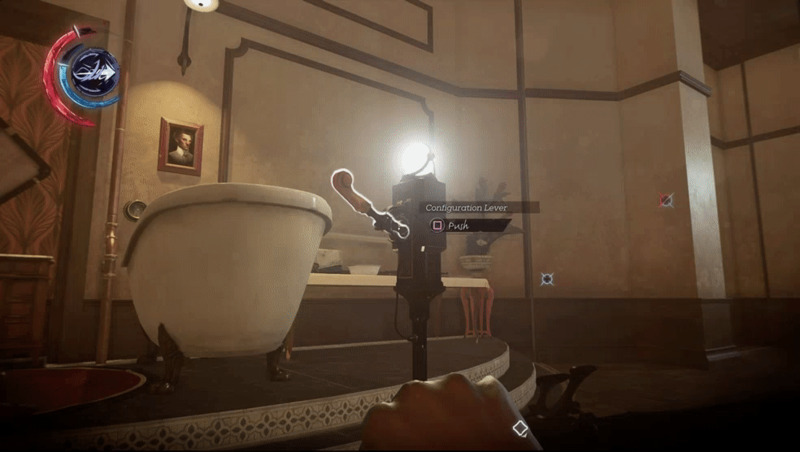 If Dishonored 2 gets one thing consistently correct, it is challenge escalation. Instead of giant leaps, the game is content with making small remixes. A benefit of the two-layered nature of the laboratory is that it provides an easy way to assault Jindosh. Distracting the patrolling soldiers tends to leave the upper level free. Intrepid players can take the risk of leaping right to Jindosh for a speedy execution. Those favoring a non lethal approach will find the electroshock machine on the lower floor. If they came from a different route or did not pick up the clue on the way in, there is an audiograph on the nearby table that outlines the machine’s usage. Activating the machine is a little bit of a puzzle, but it isn’t too difficult. A chalkboard lists how much power each part of the lab uses. The player must transform the lab into an arrangement that still leaves power for the machine. It’s a nice way of integrating the level’s core mechanic into a puzzle and is a good example of the designers squeezing extra mileage out the tools they’ve crafted. Brute forcing the puzzle is a viable option as well. It’s time-consuming, but a nearby gauge keeps track of the power level for those who work better with visual feedback instead of abstract number puzzles. Activating the machine serves up one of the cruelest non lethal takedowns of the game. Dishonored 2's options strike me as a little weaker than some of the genuinely shocking tactics employed in the original, but this is a good moment of cruel mercy. The machine leaves Jindosh as a lobotomized invalid unable to draw on his intellect. The effect here is far more devious than robbing Ashworth of her powers in the next mission. Having been hounded by Jindosh’s arrogant comments throughout the level, there’s a devilish satisfaction to be found here that is notably absent in other levels and their non lethal options. From here, we’ll work our way to rescue Sokolov. Note that the path we use as an exit here is an additional way to reach Jindosh as well. The Clockwork Mansion seems complicated, but the design tends to loop in on itself quite a bit. Objectives interconnect, and, depending on which task you choose first, exits may become entrances. The assessment chamber where Sokolov is held is a very intimidating space. It can only be entered via a nearby staircase. Stepping on pressure plates will rearrange the chamber into a shifting maze patrolled by a single clockwork soldier. Players who have bypassed these enemies until this point will be tasked with a game of hide and seek. If this is the first objective you pursue, this arena functions as a testing ground to help you formulate strategies to take on Jindosh’s guards in the lab. Luckily, the game places a stockpile of weapons and tools nearby. The game is doing a lot here. It is tutorializing the player on a new enemy, providing a testing ground for tactical options that may have been ignored, and offering a means for players who are having difficulty to forego stealth altogether with powerful tools. Another well-designed facet of this space is the boards that block certain pressure plates. The player has no choice but to destroy them. It helps communicate how the clockwork soldiers are particularly sensitive to sound while making the scenario more risky. 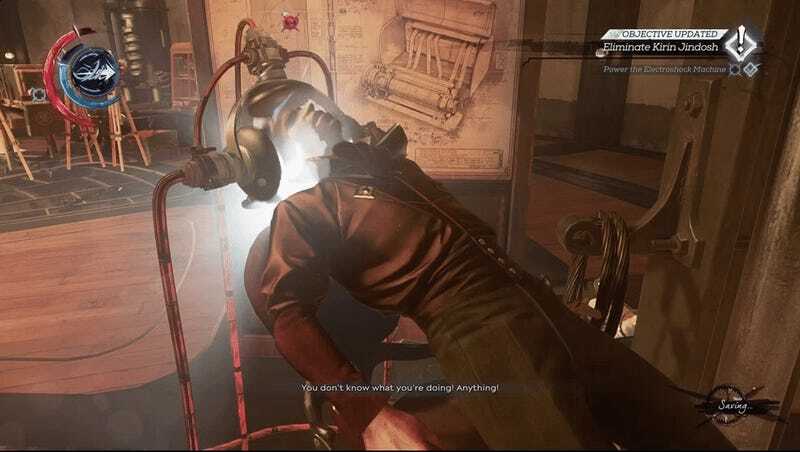 Rescuing Sokolov makes things a little tricky. The important thing to learn is that it is okay to leave him behind while you scout ahead. To communicate this, the game will always spawn a pair of guards from a nearby elevator. This elevator is the most expedient route out of the sublevel. For some players, this elevator will be the main way they accessed the assessment chamber. The additional guards are an easy way for the designers to get extra mileage out of the level. Altering the path back and adding new complications means that while players have to renegotiate old spaces, they can’t do so with total familiarity or comfort. There’s an additional exit found through a kitchen. It is possible to call down a guest room from the upper levels and use it to navigate upwards again. The guests will vacate the lounge once they are on the lower level. This means that while it can be used as another ingress point to the chamber, it functions best as an escape. The elevator will bring you to a main hall. This room is traditionally reached by heading down the lower hallway that we pointed out before initially meeting Jindosh. This space is surprisingly smart. The guest room is in an adjacent hall. This means that two paths into the assessment chamber are readily available right from the start of the mission. There’s a tesla coil in this room that can be rewired as well, offering a buffer against guards or clockwork soldiers. In the right circumstances, this hallway can be turned into a makeshift staging point for incursions deeper into the mansion. Here, we will turn it into a safe point for our journey out. But wait, there’s more to this space! It connects to a recreation room where the dining table can be replaced with a pool table. This actually functions as a fourth access point to the lower levels if players manage to sneak beneath the floor. 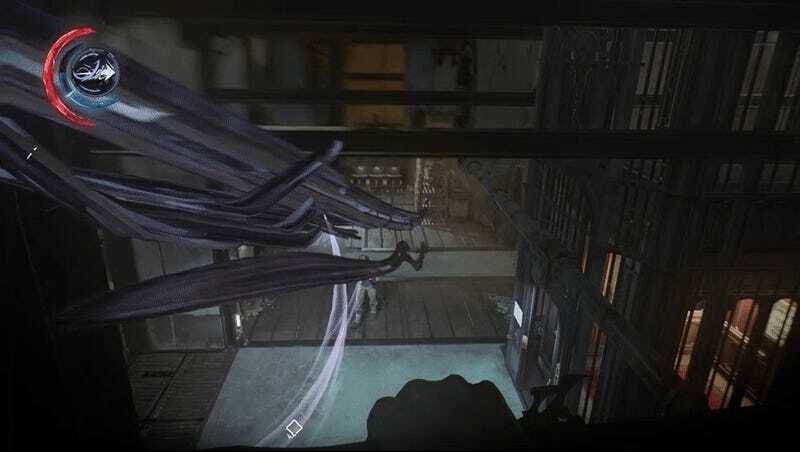 The twisting wall offers a path for us to escape the mansion with Sokolov. This is a much safer route than moving up the narrow hallway. An important foundation of Dishonored 2 level design is the occasional provision of pathways that are parallel to dangerous routes. These pathways don’t last for long and often force the player to briefly reconnect with more dangerous spaces. In this case, the crawlspace here lets players avoid most of the hallway before briefly tossing them into the final stretch of the hall. There’s a nice visual effect here as well. The hidden areas of the Clockwork Mansion retain the cold colors of Dunwall and other areas. The contrast between the meticulously projected image that we normally see and the semi run down areas behind the scene stress the artificiality of the space and of Jindosh himself. The hallway will dump us back into the first transforming room. We will also reach this space if we backtrack our initial route to the lab. Any clockwork soldiers we bypassed will still be active. However, the game also activates the previously dormant soldiers we saw at the start of the stage. This is the final challenge escalation in the level. 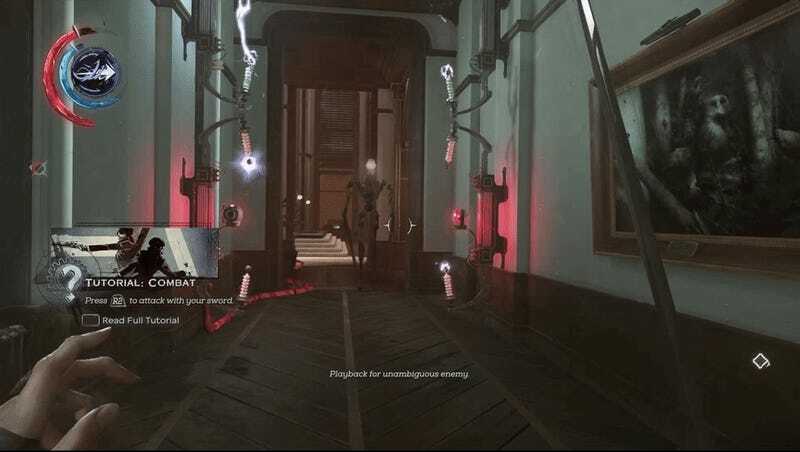 After dealing with clockwork soldiers and potentially restocking ourselves with various tools in the basement, we are able to confidently face these remaining enemies. Carrying Sokolov adds another layer of challenge as well. In this playthrough, I distracted them with sound before using my teleport to silently reach the exit. With our target dealt with and Sokolov rescued, the carriage ride once again frames the mansion in our view. Where it was initially framed as an obstacle to be tackled, we get to enjoy a view of a space that we’ve dominated and successfully overcome before heading to the lower ward and ending the mission. The Clockwork Mansion succeeds by carefully controlling its encounters and offering a series of pathways that loop and weave in and out from each other. Other levels have various ways to progress, but the Clockwork Mansion is a puzzle of a different sort. Shifting walls and circular design assure that you’ll almost never play it the same way twice. 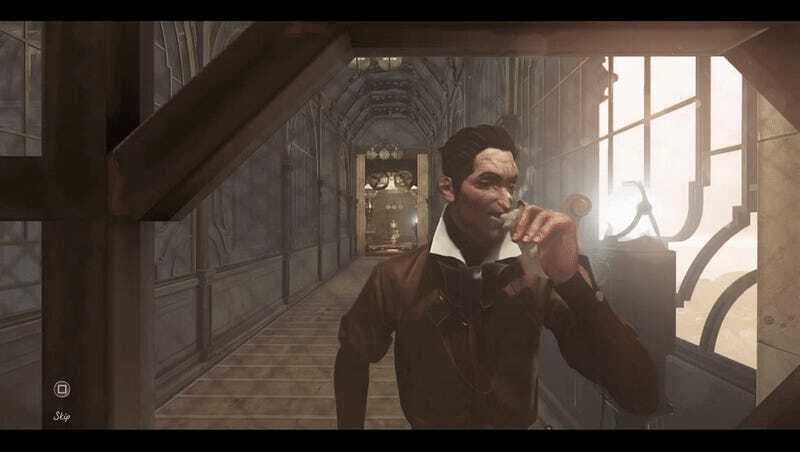 Toss in an exciting antagonist and devious ways to take him down, and the Clockwork Mansion isn’t just a great level for Dishonored 2, it’s also a great level in gaming as a whole.